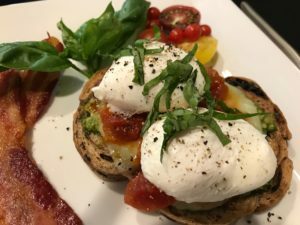 Always experimenting with recipes and with our love of traveling abroad we came up with this take on poached eggs. We always have an abundance of basil and tomatoes from the garden so along with mozzarella cheese we added basil pesto and tomato jam. If our guests like poached eggs they rant and rave about our Italian Eggs Benedict. This entry was posted in Breakfast is Served by admin. Bookmark the permalink.